﻿ How to AirPlay AVI, MKV, DivX, MP4, MOV video files to Apple TV? Home » video » How to AirPlay AVI, WMV, MKV Video Files? How to Successfully AirPlay AVI, MKV, WMV, DivX, MP4, MOV Movie Files to Apple TV? AirPlay, developed by Apple Inc. makes it possible for us to wirelessly stream digital content like movies, music, and photos from iPad, iPod, iPhone, or computer to television with Apple TV 2 (2nd generation) or new Apple TV 3. However, Airplay isn't universal streaming application. There is still format limitation for steaming. Any format iTunes cannot support like AVI, MKV, WMV, DivX, XviD, and FLV video format, Airplay will not steam. Even you steam your video by the help of some Airplay app; problems always occur when playing the movie files, such as airplay only audio and no video at all. This article introduces an easy way to AirPlay various video files to Apple TV from Mac/PC/Macbook/iMac/iPad/iPhone for play including AirPlay AVI, MKV, DivX, XviD, MP4, MOV, MPG, F4V, FLV, 3GP, MTS, M2TS, MOD, TOD, WebM, OGM, MXF, WTV etc. It even helps to AirPlay various 1080p video formats on the new Apple TV 3. Free download the professional Bigasoft iTunes Video Converter - Bigasoft iTunes Video Converter (Mac Version, Windows Version), install and launch it. Bigasoft iTunes Video Converter is professional all-in-one converter for iTunes! Benefiting from the most advanced conversion and efficient performance technology, Bigasoft iTunes Video Converter can convert various videos to iTunes video MP4, MOV with fast speed and high graphic and sound quality. Adding any movie files to iTunes 10.6 and the earlier version iTunes is never so fast and easy! It optimizes ready high quality video for all models and all types of Apple devices including iPod, iPhone, iPad and Apple TV. Click "Add File" button to import files that Airplay cannot stream. There are several situations according to your source video and how you choose to airplay your videos. 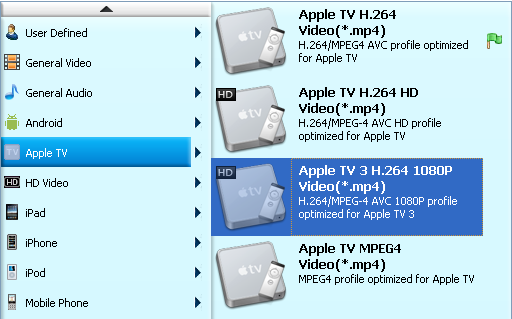 To stream stand definition AVI, XVID, DIVX, WMV, etc from Mac/iMac/Mac book/PC to Apple TV/Apple TV 2/Apple TV 3 via AirPlay, select Apple TV H.264 Video (*.mp4) from "Apple TV" category in the "Profile" drop-down. To stream HD, AVCHD video from Mac/iMac/Mac book/PC to Apple TV or Apple TV 2 via AirPlay, select Apple TV H.264 HD Video (*.mp4) from "Apple TV" category in the "Profile" drop-down. To AirPlay 1080p video to the new Apple TV 3, select Apple TV 3 H.264 1080p Video (*.mp4) from "Apple TV"category in the "Profile" drop-down. 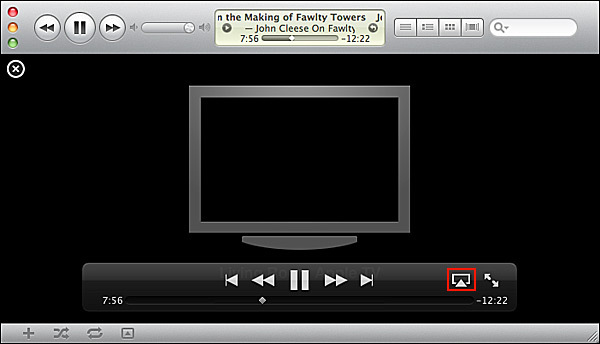 To Airplay stand definition AVI, XVID, DIVX, WMV from iPad/iPod touch to Apple TV, select iPad H.264 video (*.mp4) from "iPad" category in the "Profile" drop-down. To Airplay AVI, XVID, DIVX, WMV from iPhone to Apple TV, select iPhone H.264 video for TV (*.mp4) from "iPhone" category in the "Profile" drop-down. Click the button of "Convert" button to finish the conversion. To Airplay movies from PC/Mac/iMac/Macbook to Apple TV, when the conversion is complete in Step 2, click "Open Folder" to locate the converted video files. Hit on "Play Movie" button in iTunes. The movie will start playing. You'll notice an AirPlay icon in the bottom right corner of the iTunes application show up. Click it, select "Apple TV" and your video will begin streaming from Mac/iMac/Macbook/PC. To Airplay movie AVI, MKV, DivX, XVID, MP4, WMV, etc from iOS devices iPad/iPhone/iPod touch, click "Open Folder" to locate the converted video and drag to iTunes and transfer to iPad/iPhone/iPod touch. Tap the AirPlay icon in a video app. Then videos will be streamed to your HDTV via your Apple TV. To airplay AVI, MKV, DivX, MP4, MOV, FLV and other Apple TV won't support format video to Apple TV for playing on television is so easy with the help of Bigasoft iTunes Video Converter. Free download the program now to enjoy fantastic movies right now. "I recently purchased Bigasoft iTunes Video Converter to convert AVI files to suit Apple TV. I was initially told I had to "jailbreak" the Apple TV then install other software using the DOS screen on my Windows PC. I am no computer wizz and have no experience with DOS, so I looked for another solution. I have spent money on and tried several other products on the market but have had the best results with your program. I am so happy with your product, I wanted to say thank you. The program is easy to use and converts files quickly and easily. Congratulations on a great product."